JOIN OUR DOG BED FAIRY FLOCK! 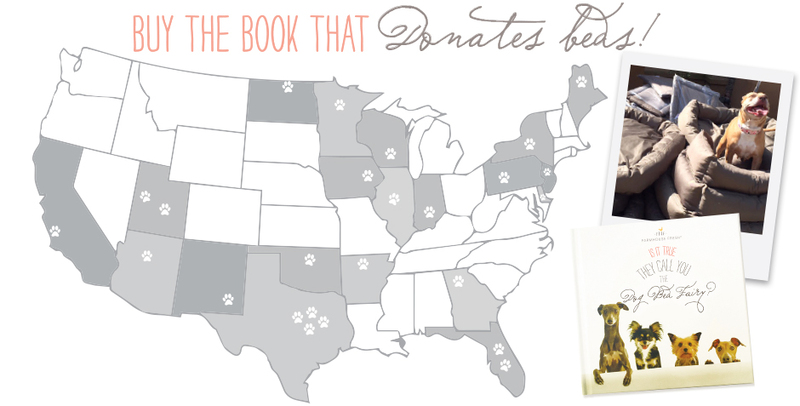 With every purchase of our heartwarming $10 picture book, we donate $7 to dog beds that outfit shelters across the country (every penny except the cost of the printing goes to beds -- we even pay for the dog bed shipments to each shelter!) 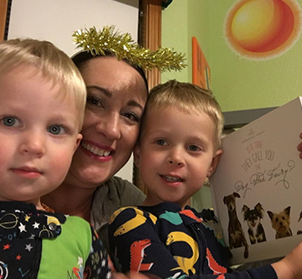 All book purchasers have the option of sending in a photo of themselves or a loved one, and our artists certify the picture -- adding wings and a halo! Join over 5,000 Fairies who have helped us outfit entire shelters across the U.S. Over $70,000 in dog beds have been donated so far. Plus, we surprise-gift members of our Fairy Flock that we find on social media every month. We're lifting hearts and warming bums everywhere. It takes most potential adopters less than 70 seconds to evaluate a dog in the kennel according to the American Society for the Prevention of Cruelty to Animals (ASPCA). Euthanasia is the leading cause of death of our companion dogs in shelters, as many dogs are passed over in that short time frame that families take to evaluate them. What can a simple dog bed do? It saves lives! A warm dog bed helps animals feel less scared and more safe, letting their personality shine over their fear in those 70 seconds. The Dog Bed Fairy project helps animals find furrever homes. 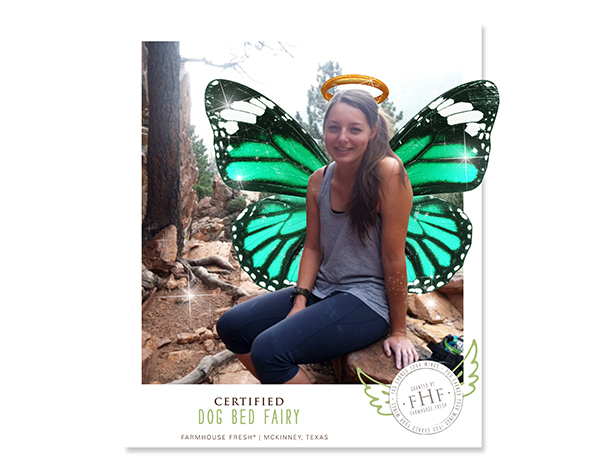 JOIN THE FHF DOG BED FAIRY FLOCK! 1. 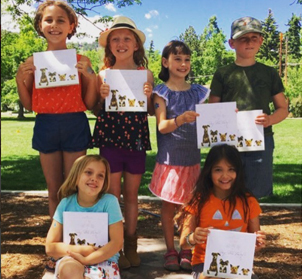 In an amazing show of kindness, the third graders in Diane Bramble's class from Friends' School in Boulder, Colorado all became official Dog Bed Fairies when Diane bought ‪#DogBedFairy‬ Books for the entire class as a gift of gratefulness to end their school year. The boys and girls were thrilled to improve the lives of shelter dogs by helping provide them with beds. Kudos to Diane for gathering some of her students for this wonderful group photo! 2. 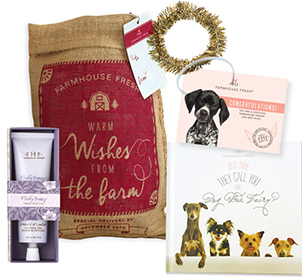 Our most popular Dog Bed Fairy Gift Set comes complete with a halo and fluffy bunny hand cream! 3. We surprise random Fairies on social media with FHF gifts. Meet our recent Fairy Flock winner, Tricia F. from Las Vegas, NV. Tricia is an esthetician known as "Vegas Beauty Snob." Thank you Ms. Tricia for joining the flock! To date, over 5,000 Fairies like Tricia have made outfitting all the shelters listed below possible. Dog bed donations have been made to: HERKIMER COUNTY HUMANE SOCIETY, Mohawk, NY; PAWS + CLAWS RESCUE, Hackensack, MN; NUZZLES & CO.,Park City, UT; ALMOST HOME HUMANE SOCIETY, Lafayette, IN; JACKSON COUNTY HUMANE SOCIETY, Newport, AR; SEAL BEACH ANIMAL CARE, Seal Beach, CA; VOORHEES ANIMAL ORPHANAGE, Voorhees, NJ; CUMBERLAND VALLEY ANIMAL SHELTER, Chambersburg, PA; CLAY COUNTY ANIMAL CARE, Green Cove Springs, FL; IVINS ANIMAL SHELTER, Ivins, UT; LUCKY PAWS, Scottsdale, AZ; WOOFSTOCK, Little Elm, TX; DALLAS DOGRRR, Dallas, TX; A FOREVER HOME, Yalaha, FL; PAWS ATLANTA, Atlanta, GA; TAPS NO KILL SHELTER, Pekin, IL; GREATER ANDROSCOGGIN HUMANE SOCIETY, Lewiston, ME; COLLIN COUNTY ANIMAL SERVICES, Mckinney, TX; GARLAND ANIMAL SERVICES, Garland, TX; COLUMBIA COUNTY HUMANE SOCIETY, Portage, WI; CEDAR BEND HUMANE SOCIETY, Waterloo, IA; TURTLE MOUNTAIN ANIMAL RESCUE, Rolla ND; BRANDYWINE VALLEY SPCA, Georgetown DE; PET ANGELS, Gutherie OK; NOAH'S ARK ANIMAL SHELTER, Carlsbad NM.